Harmonica and Guitar rocker! Mid-Paced BLUES BOPPER. Club Favourite! 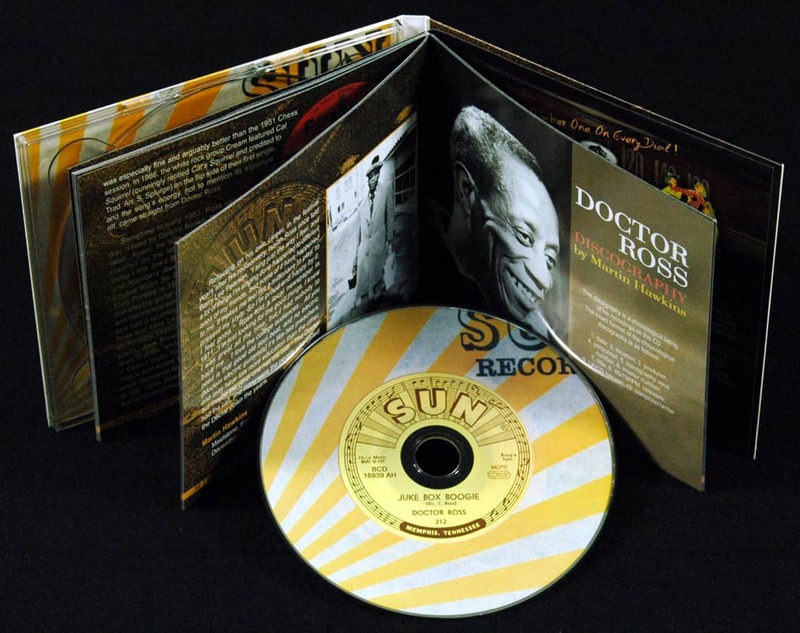 I saiah Ross was born in Mississippi, made his reputation as a bluesman in Memphis, then moved to Michigan for over 30 years to hold down a day job emerging occasionally to perform as a one-man band – playing harmonica, guitar, and drums. He almost retired from music before he was persuaded to appear on festival stages and the blues revival circuit in the mid-1960s. His image then was a dream for publicists and journalists alike - with his stage name of 'Doctor' and his theme song about curing the 'boogie disease.' Ross was not the first to use the theme of the musical medic come to help you feel better - Doctor Clayton and others got there first - but Ross's take on the medic idea was the boogie; if you wanted to hear good-time music, or wanted to shake your thing, or indeed wanted the other thing 'boogie' implied, then he was your man. Ross was one of the very best at creating highly rhythmic back country dance music and at recycling folk blues couplets – mainly drawn from the recordings of Sonny Boy Williamson – to which he added some of his own wry humour and wit. But the music he originally made, down in Southern juke joints and radio stations in the 1940s and early 1950s, was not performed as a one-man band. He was very much part of the small group scene, renowned for his prowess as a harmonica player and vocalist. 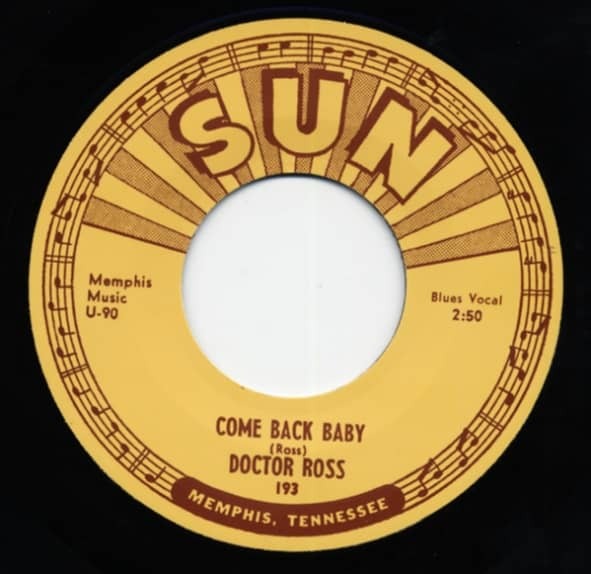 This CD traces Ross's recording career before his re-emergence; from the very beginnings with Sam Phillips in Memphis, when his style on Chess and Sun had a freshness that sounded current even though it was based on much older songs and styles, through his transformation into a solo performer and to his surprisingly wide range of blues recordings on the Detroit labels DIR, Fortune, and Hi-Q. Here you will find all the Sam Phillips sessions and every other disc issued as a single by Doctor Ross before his rediscovery and re-promotion as the last original one-man band. Sam Phillips once told me: "Doctor Ross had a very special sound. He had a great command of his music and a real instinct for what was going on around him. 'Chicago Breakdown' is one of the better records I think I ever heard in my life, if I am allowed to say that." Isaiah Ross (though some sources show his name as Izear or Isaich and others as Charles Isaiah) was born on October 21, 1925 out in the country around Tunica, Mississippi. The 1930 Federal Census recorded him as Izear, living near White Oak Creek on rural census Beat 4 with his father Jake Ross and his mother Loudie Nixon (her name also changed from one official document to another, being variously Ludia, Luda, or Luci). Jake was from Utica, Mississippi and Loudie from Hinds County, Mississippi. They had been living on Walnut Lake Road near Dooley Woods in Tunica County in 1920 when the census recorded their family name as Rawls, not Ross. Isaiah was the youngest of a family of five boys and six girls, brought up in farming country some 40 miles south of Memphis. He remembered people calling him 'Dusty' because he was always playing in the dirt on the farm. In later years his friends called him 'Ike'. Ross always said that music was all around him as he grew up. He said that his father, Jake Ross, played harmonica well enough to teach him the basics. Ross told interviewer Barry Lee Pearson: "on both sides there were musicians and I guess when I was born I just had that in my blood... then my sisters would buy me some harmonicas and I learned how to play, but I grabbed it backwards because I'm left handed so I have my coarse keys to my right and my fine ones to the left." He remembered listening to hillbilly radio shows and particularly harp players DeFord Bailey on the Grand Ole Opry and Lonnie Glosson and Wayne Raney from a station in Little Rock, Arkansas. Ross remembered playing harmonica at age six for relatives and house parties and he learned a little about the guitar from a neighbour, George Paul Jackson, with whom he worked 'professionally' at 'birthday parties' from age 11. From the house parties he graduated to the juke joints in Tunica. "See, I'd tell my father I was going to see a show in Tunica and stay all night with my brother. But I'd ease out to the juke house and play, and the people was giving me nice money." The group he played with often included pianist Willie Love and guitarist Wiley Gatlin. He said, "I met Wiley when I was about 12 or 13, he was years older, was married and had kids." Wylie (sic) Gatlin was recorded as a cotton farmer on the Wilson Plantation north east of Dundee in Tunica County at the time of the 1940 federal census which noted he had a wife and two children there. In 1942, G. P. Jackson was drafted (and later re-emerged as Kansas City Bo Diddley) and Willie Love moved to Helena, Arkansas leaving 17 year old Ross and guitarist Wiley Gatlin – "the best picker you ever saw" – to form a new group with John Dillon – "now, he was a guitarist, man he could play, but he was a bit wild, you know, killed a man playing 'Georgia Skin'" - and washboard player Reuben Martin. 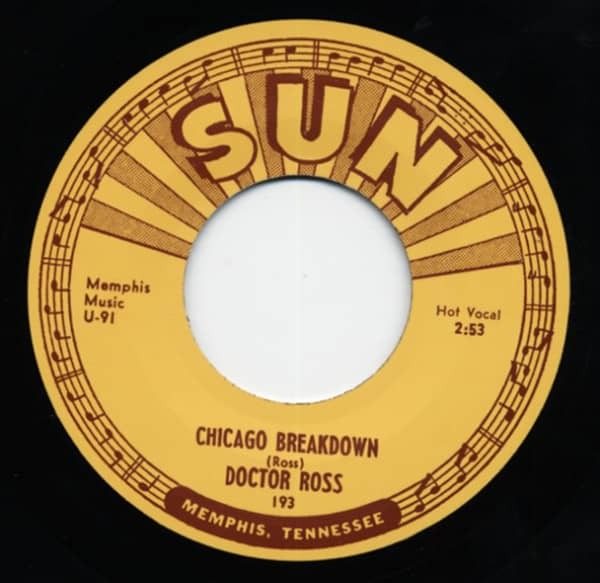 Ross was primarily a harp player at this time, influenced by the recorded music of John Lee 'Sonny Boy' Williamson, a Tennessee native who had moved to Chicago in 1934 and whose records were on all the juke boxes. Ross also studied musicians he saw playing locally including Bukka White and the peg-legged drummer Roosevelt 'Barber' Parker who featured at Harold Clanton's cafe in Tunica. Among the artists touring with Parker at that time were recording artists Memphis Minnie and Son Joe, and although Joe was mainly a guitarist it was the sound of his washboard playing that remained in Ross's memory. Isaiah Ross has described how he moved to Helena, Arkansas in 1943 and played harmonica over radio KFFA there. This was cut short almost immediately when he was inducted into the Army on December 16, 1943. He told interviewers he served in the Pacific during the War. During his basic training he won first prize in the new recruits' talent show. He said, "When I got in the service I had no one to play music with me and I just bought me a guitar. And I wrote home to my sister and she sent me a harmonica rack and then I started playing for USO shows after my basic training. They said they'd never seen nobody play that thing like I could play." Military records show that on November 22, 1945 Private first class 34879534, Isaich (sic) Ross, a former enlisted man, was re-enlisted in Belmont, California to the Corps of Engineers for work in the Panama Canal Department. He was described as having a skilled occupation with electrical machinery. 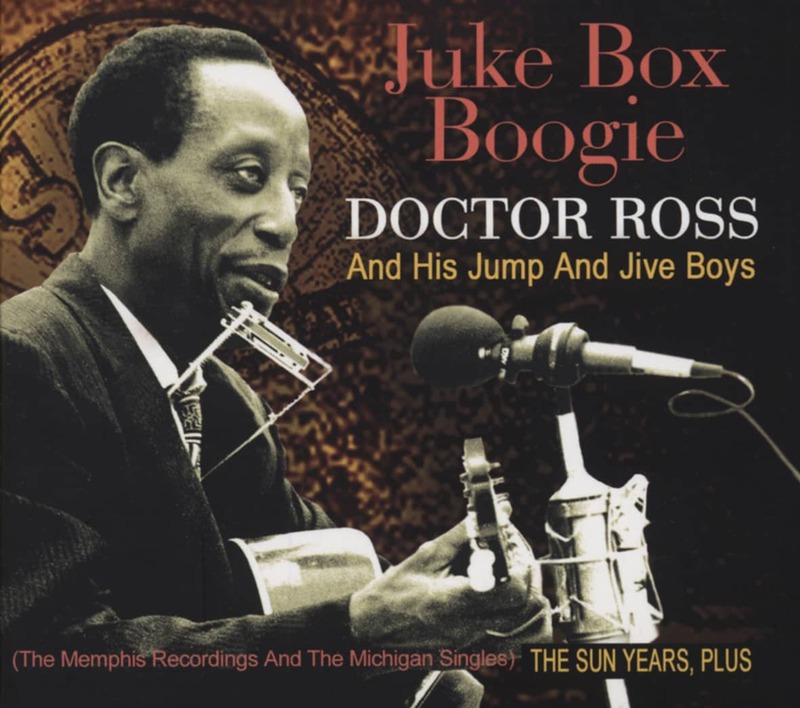 Ross later told some interviewers he had been in the Medical Corps, and by the time he got back to Mississippi in September 1947 he had taken to carrying all his harmonicas in a bag resembling that of a medical man. People started asking him to break open the 'doctor bag' to get his musical instruments out. He later told interviewer Chris Baird: "On my first furlough I came home carrying this bag that looked like a doctor's bag and the people looked in and I had 24 harmonicas in there. They all said they'd been sick for the blues and boogie rhythm since I been gone, so they called me the doctor of the blues that they needed so bad." Customer evaluation for "Come Back Baby b-w Chicago Breakdown 7inch, 45rpm"